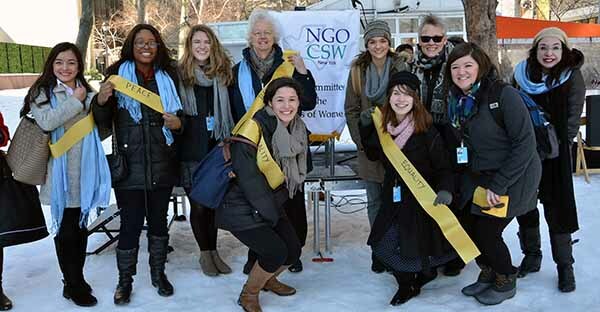 The SSND delegation attended the NGO CSW rally at Dag Hammarskjold Plaza. In front: Elena Benassi, student from Notre Dame Preparatory School (NDP); Joey Wagner, student from Notre Dame High School (NDHS); and Katie Mallette, NDHS admissions director. Back row, from left: Jaya Sharma and Arianne Rowe, students from the Academy of the Holy Angels; Maddie Tewey, NDP student; Sister Eileen Reilly; Maggie Meystrik, NDHS student; Gail Caltride, NDP teacher; and Jennifer Cucchisi, Holy Angels teacher. School Sisters of Notre Dame delegates spent Thursday immersed in U.N. Commission on the Status of Women events, activities and forums and found time to participate in a rally to celebrate the successes of the international women’s movement and the fight to end poverty and violence against women of all ages. For Joey Wagner, a student from Notre Dame High School in St. Louis, Missouri, the program, “It Starts with Safety: Adding Girls to the Global Agenda,” was particularly meaningful. The panel included first person accounts about challenges and hardships related to education, health care and living in war-torn countries around the world. Maddie Tewey, a student at Notre Dame Preparatory School in Towson, Maryland, said that listening to the panelists share the efforts they have made and their accomplishments as they worked to improve conditions for women and girls was inspiring, especially because they have accomplished so much as young girls and teenagers. “It’s really incredible to see that even the small people can make a difference,” Maddie said. The day’s sessions at the United Nations offered a vast variety of programs, including those on Women, Peace and Security; Violence Against Women in Politics and Parliament; The Changing World of Work with a Need for 21st Century Skills; Indigenous Women in the Changing World of Work; and Women Making News in the Changing World of Work. Sister Eileen Reilly, SSND, also attended the briefing at the U.S. Mission. Each evening the group spends time journaling about what they saw and heard, how they were affected by the experience, and what they plan to carry forward.